Vijay TV’s Airtel Super Singer 4 has the Special guest of honor Asha Bhosle on the episodes airing from 04 Nov 2013 onwards, Don’t miss to watch more than 25 play back singers who thronged in to meet this legendary singer who feel so young and energetic even at this age. This special episode also features exclusive video clips of ulaganayagan Kamal Haasan and A.R. Rahman, the Oscar award winner. Asha Bhosle share interesting anecdotes about her affinity towards the legendary actor Sivaji Ganesan family. 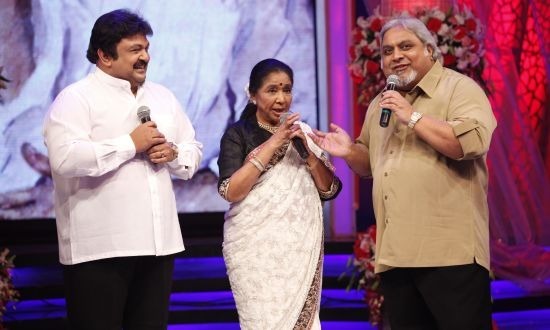 Actor Prabhu and Ramkumar walked into the sets to meet Asha Bhosle and shares some unforgettable moments. Watch the exclusive episodes of Airtel Super Singer 4 on Vijay TV at 9 pm from 04 November 2013 onwards.